I'm compelled to point out the uniqueness of this record: it's a novelty song, but also a doo-wop single, an outer space epic complete with special effects, a dance record and in a way even a "surf"-style song (from the Jan and Dean school of phraseology). I'm hard pressed to come up with another recording that touches all these bases. This was a family affair: The Ran-Dells, brothers Steve and Robert Rappaport of Wildwood, New Jersey and their cousin, John Spirt, came up with the idea for "Martian Hop" while hanging out on the Jersey coast in the summer of 1962, singing for whoever would listen, often a hundred or more beachgoers at a time! Once inspiration struck, and it did so quickly, the three had written their catchy song, featuring timely references to the Loco-Motion and Hully Gully, two of the more popular dances at the time. But what do do next? Steve, attending Brandeis University in Waltham, near Boston, Massachusetts, had access to the the school's recording equipment and came up with sound effects for the record including a clip from "Moon Maid," taken the album Electronic Music, released a year earlier by The Electrosoniks (Tom Dissevelt and Kid Baltan, experimental musicians from the Netherlands). The long, high-pitched "space" noise at the beginning is reminiscent of the echoing, swirling sound those everlovin' giant ants made in the 1954 cult classic sci-fi film Them! The three managed to book an hour of time at Bell Sound Studios in New York City, creating their mini-space-opera with its "Papa-Oom-Mow-Mow"-esque beat as well as its flip side. Later, with the help of Brill Building songwriter Gerry Goffin, they secured a deal with mogul Don Kirshner to have the single released on the Chairman label, a newly-created London Records subsidiary. It hit the airwaves around July 1963, impossible for listeners to ignore (a tricky thing too, when at the same time hits like "Tie Me Kangaroo Down, Sport" by Rolf Harris and "Hello Muddah, Hello Fadduh" by Allan Sherman made it seem like a "Summer of Novelty"). No doubt the premiere of CBS sitcom My Favorite Martian starring Ray Walston and Bill Bixby in September helped propel the single and prolong the Martian Madness well into the fall of '63. The flip side, by the way, is quite a different affair; "Forgive Me Darling (I Have Lied)" reveals a pop-doo-wop side of the group without all the silliness, quite simply a catchy and well-produced ballad. A follow-up, "Sound of the Sun," appeared next on Chairman, a distant-star-dance-ditty subscribing to the same formula; "Come On and Love Me Too" on the flip had a surf sound. 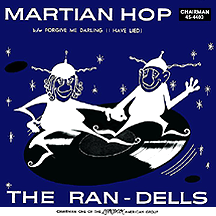 The Ran-Dells released one final single on R.S.V.P. in early '64, the uptempo "Wintertime" backed with a ballad, "Beyond the Stars," each forgoing any gimmicky space shenanigans. Afterwards, Spirt and the Rappaport brothers came back down to earth and resumed conducting themselves in a manner befitting well-behaved earthlings. Amazingly, "Martian Hop" has been remade several times over the years. This is unfair to each of the other six planets (or seven, if you still count Pluto). None of them can claim a big pop hit, an anthem for their planet, if you will. Unless, of course, I've missed the real meaning of Frankie Avalon's "Venus."